I have written about sea level rise here: here, here, here, here and here. The previous essays are not prerequisites but are interesting specific examples. SLR is a real imminent threat to coastal cities and low-lying coastal and near-coastal densely-populated areas. SLR is not a threat to anything else — not now, not in a hundred years — probably not in a thousand years — maybe, not ever. 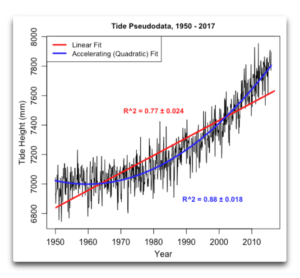 This modern rate – just 0.17-0.18 of a meter per century – has remained relatively unchanged from the overall 20th century average, and there has been no statistically significant acceleration in the sea level rise rate (just 0.0042 mm/yr-²) since 1900. Water Intrusion in the Chesapeake Bay Region: Is It Caused by Climate-Induced Sea Level Rise? Our findings indicate that the water intrusion problems in the region are due not to “sea level rise”, but primarily to land subsidence due to groundwater depletion and, to a lesser extent, subsidence from glacial isostatic adjustment. We conclude that water intrusion will thus continue even if sea levels decline. These findings are critical because the water intrusion problems in the Chesapeake Bay—and elsewhere—cannot be successfully solved unless their causes are correctly identified and appropriate remedies are devised. In recent months, two new papers published in The Cryosphere have provided a condensed summary of the ice-melt and sea-level-rise consequences of global warming for the Arctic region. 1. Between 1900 and 2010, the Greenland Ice Sheet (GIS) has melted so extensively and so rapidly that the GIS ice-melt contribution to global sea level rise has amounted to 1.5 centimeters for the entire 110-year period. One-and-a-half centimeters. That’s 0.59 of an inch! 2. It gets worse. Between 1993 and 2010, the contribution to global sea level rise has been a disturbing 0.39 of a centimeter. Almost 4/10ths of a centimeter. That’s 0.15 of an inch! That’s right, according to NASA, sea levels are going DOWN! This is big news. How come the media hasn’t mentioned it? I’ve looked at UK sea level rise, but what about global? As you can see, the rate of rise was very similar between roughly 1930 to 1960, as it has been since 1990. We see the same pattern at UK sites. David’s graph mirrors that of the original paper. 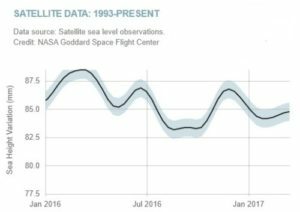 As with most sources of sea level data, the scale is set to make the rise appear to be astronomic. 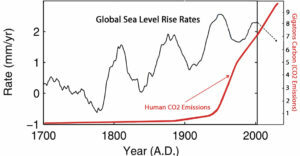 Sea Level Rise Accelerating? Not. This question all revolves around whether the rate of sea level rise is relatively steady, or whether it is accelerating … so how do we tell the difference? When I read that, I (like everyone else) assumed that corrections to the satellite sea level data since 1993 have now led to a revised trend toward faster (not slower) sea level rise. Right? The video is worth watching. The CBS reporter makes the usual attempts to blame it on “climate change”, but the locals know too much to fall for that old pony. 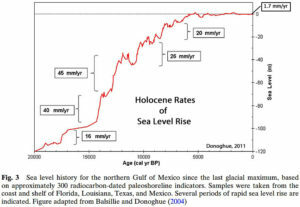 They know that sea levels have been rising, and land eroding, since 1850. And they are right. Tide gauges in the area, such Sewell Point, Norfolk, confirm that sea levels have been steadily rising for a long time, long before recent rises in emissions of CO2. From a post a couple of days ago: “an F10.7 flux above 100 causes warming and below that level causes cooling.” Greg asked “Can you prove that?” I already had in this WUWT post from 2012. But it is worth revisiting the subject because it answers the big question – If all the energy that stops the Earth from looking like Pluto comes from the Sun, what is the solar activity level that corresponds to our average climate? Because solar activity is falling and climate will follow.